The Justrite AccuFlow type II galvanized steel safety can has a 9" long metal hose with a squeeze-trigger spout, a 3.5" stainless steel flame arrester, and an automatically venting leak-tight lid for storing and transporting gasoline, oil, kerosene, diesel, and other compatible flammable liquids. The 24-gauge galvanized steel can resists rust and corrosion. The flexible metal hose with squeeze-trigger spout helps provide controlled pouring. The stainless steel flame arrester is chemical and corrosion resistant, and helps to prevent the can�s contents from igniting. The gasketed lid is leak-tight, self-closing, and vents automatically, helping to reduce air blockages that can interrupt the flow of liquids as well as pressure build-up inside the can. The can's red color allows color coding to designate gasoline and other flammable contents. The warning label on the can has an area to add information. The fill port has an ergonomic handle that allows the port to be opened quickly. The can comes with an extra cap. This Justrite AccuFlow type II galvanized steel safety can meets standards set by FM Global (FM); Underwriters Laboratories (UL); Technical Inspection Association (T�V), Occupational Safety and Health Administration (OSHA); Spill Prevention, Control and Countermeasures (SPCC); and is designed in accordance with National Fire Protection Association (NFPA) code 30. When used according to manufacturer�s recommendations, this product is covered by a 10-year warranty against defects in workmanship or materials. 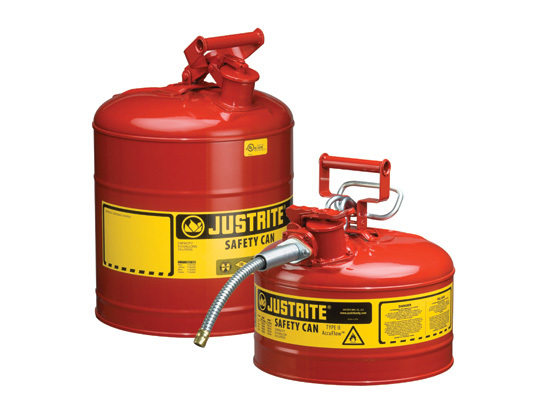 Justrite manufactures safety equipment to store, transfer, use, and dispose of hazardous materials. The company, founded in 1906, is headquartered in Des Plaines, IL.